Getting a glimpse of the real world and experience in their field of interest is important for all students, especially for young artists who aspire to portray different aspects of life through their work. Han Sung Motor, the largest official dealer of Mercedes-Benz here, which initiated the CSR art project Dream Gream in 2012, participated in the 17th Korea International Art Fair earlier this month to broaden the horizons of young artists by enabling them to take part in one of Asia’s biggest art markets and art shows. “The idea (behind participating in the fair) was to try to give students more exposure rather than doing everything inward (within the program). Also giving students the exposure of (their) art work and just getting a real world touch about reactions and feedback,” Han Sung Motor CEO Ulf Ausprung told The Korea Herald on the third day of the fair at Coex in southern Seoul. Ausprung, who also teaches design management at Seoul’s Yonsei University, added that Dream Gream was given a bigger booth at a prominent location this year in recognition of last year’s success. 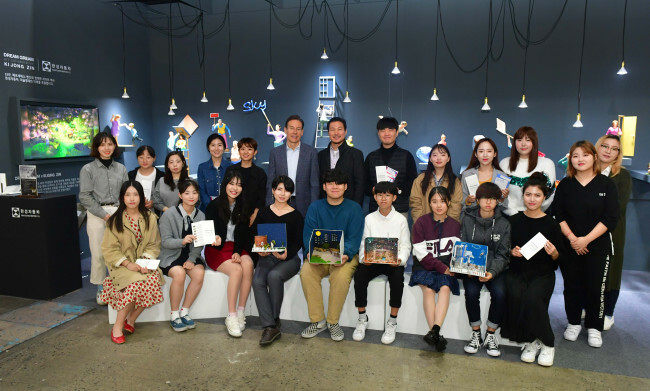 An installation work titled “The Unknown Village,” created by Dream Gream students in collaboration with up-and-coming Korean artist Zin Ki-jong, was displayed at the event Oct. 4-7. With a mission to support young artists from disadvantaged families until they graduate high school, the Dream Gream art scholarship project offers diverse educational programs, including mentoring sessions with undergraduates studying art at university, meetups and opportunities for collaboration with famous artists, intensive summer art camps and financial support. The program kicked off in 2012 with 20 mentees and had already doubled the number of mentees by 2015. To date, a total of 69 mentees and 113 mentors have enrolled in Dream Gream, according to Han Sung. In recognition of Han Sung’s CSR efforts and its contributions to society, in October 2016 Seoul Mayor Park Won-soon awarded honorary Seoul citizenship to Ausprung. Han Sung Motor also received a commendation from the minister of culture at the 2017 Mecenat Awards, and it was identified as one of seven companies that had undertaken outstanding CSR activities at last year’s Seoul CSR Awards, where it also received a commendation from Seoul’s mayor, the dealer said. Besides nurturing young artists, Ausprung hopes Dream Gream will help them develop their social skills through interactive programs and participation in arts events like KIAF. “Even at a young age they have become more complete, enhanced human beings (by learning) social interaction. 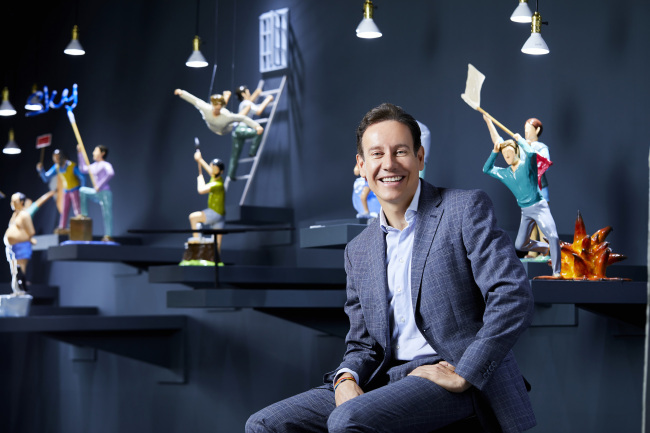 Because (mentees in) the program come partly from, let’s say, not so easy backgrounds, sometimes when they come into the program the mind is occupied with all those memories,” Ausprung said. “The Unknown Village” consists of 30 works by Dream Gream students, each depicting a different story in an imaginary world. The students created the work in July in collaboration with Zin Ki-jong at the seventh annual Dream Gream intensive art camp at a resort in Gangwon Province. The three-day summer camp was led by Zin as well as installation artist Yoona Myung, artist Lee Ji-hee, who specializes in paper sculptures, and graphic design studio Sugarmeat Studio, among others.